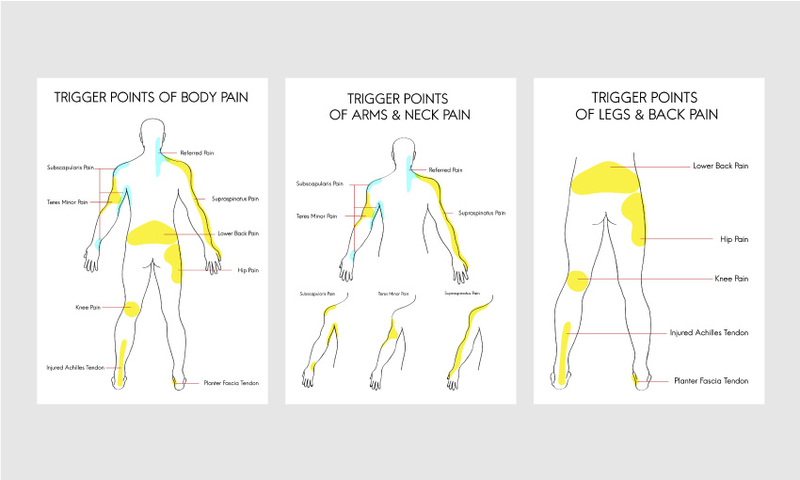 Tender points are one of the defining features of the chronic functional pain disorder fibromyalgia. So-called "trigger points" — a common characteristic of chronic myofascial pain — are different in that they lead to pain that radiates outward from the source, a phenomenon known as "referred pain". Because many fibromyalgia patients also experience myofascial pain, it is not surprising that tender points and trigger points are sometimes confused. We'll be looking at the symptoms of both fibromyalgia and chronic myofascial pain in an effort to help you tell them apart. Fibromyalgia can produce a rather broad range of symptoms that are unique in every patient and will also periodically get better or worse. Seasonal changes, your levels of physical activity, and how stressed you are all represent factors that impact the severity of your symptoms at any given time. Fibromyalgia sufferers can, however, expect to be plagued by some combination of widespread pain, fatigue, sensory sensitivity, sleeping difficulties, stiffness, headaches, irritable bowel syndrome, and so-called "fibro fog" — cognitive challenges associated with the disorder. Let's take a closer look at these. "Widespread pain" is both pretty descriptive and actually rather vague — you may experience discomfort or downright agony all over your body, or your pain may be concentrated in localized areas, often the back and neck. Though the pain may lift slightly during some periods, you're probably going have some level of discomfort more or less constantly. It's not normal to scream out in pain when someone gives you a pat on the shoulder — but if you have fibromyalgia, it may just happen. Overactive nerves make people with fibromyalgia incredibly sensitive to pain input, and if even that pat on the shoulder hurts, bumping into a table or dropping something on your foot is going to be excruciating. The sensitivity likely won't be limited to physical stimuli, either. Loud noises, bright lights, smells, foods, and smoke can all send you into sensory overload. Feeling stiff is another common fibromyalgia symptom, which may be at its worst when you've just woken up or done desk work for hours — that is, maintaining the same position for a good while increases your stiffness. Painful muscle spasms are likewise associated with this stiffness. Getting a good night's sleep is a challenge when you suffer from chronic pain, and fibromyalgia patients often find they wake up several times a night, just can't sleep, or wake up feeling like they haven't slept at all, even if they actually got more than their obligatory eight hours in. Poor sleep quality is one of the reasons folks with "fibro" suffer from fatigue. Your fatigue levels may range from a mild, low-level "sleepy head" feeling — the type of tiredness most people experience after not getting enough sleep — to an all-out "I really can't function today" situation. Headaches, especially migraines but also milder headaches, are another often-seen symptom in people suffering from fibromyalgia. Those patients who struggle with neck and shoulder stiffness are especially likely to be affected. Note that migraine often induces nausea as well. Irritable bowel syndrome, a digestive-system disorder, isn't uncommon in people with fibromyalgia. Stomach pain or cramps, which can be severe, are a common symptom, along with abdominal bloating and alternating constipation and diarrhea. It is only logical that a condition that leaves you in constant pain, feeling tired and unable to function can make you depressed in the long run. In addition, fibromyalgia may cause hormonal imbalances that make depression and anxiety even more likely. There is no cure for fibromyalgia at the moment, unfortunately, but there are things fibromyalgia patients and their doctors can do to produce some symptom relief. Because fibromyalgia symptoms are so varied, your management plan — in which both medications and lifestyle changes will feature — will be individualized. Some experimentation may be necessary before you land on a treatment plan that works well for you, so your healthcare provider(s) will be an invaluable partner in the process. Some people with fibro may see a number of specialists; neurologists, gastroenterologists, psychologists and rheumatologists are all sometimes involved in the treatment of fibromyalgia. Another chronic pain disorder that may strike people already suffering from fibromyalgia, myofascial pain syndrome causes referred pain following pressure on trigger points, which are especially sensitive spots within your muscles. Because the pain doesn't necessarily manifest anywhere near its origin point, you may have no idea where the pain comes from. Myofascial pain syndrome often sets in after a person makes the same kinds of motions over and over again for a long period of time — this may happen over the course of your professional life, but also after a muscle keeps contracting on its own. Myofascial pain syndrome causes a stubborn, aching muscle pain that often worsens with time. It isn't your typical post-workout soreness, so your treatment may consist of a combination of pain medication, injections into your trigger points, physical therapy, supplements for muscle pain and relaxation techniques. Sedatives and antidepressants may also help. Non-pharmacological treatment can be extremely helpful, so we'll take a look at options your doctor may suggest. Stretching therapy is done under the care of a physical therapist, who will teach you how you can find relief from the pain originating in specific muscles. When trigger points get in the way, numbing medications can help you get through. Posture training. Proper posture is very important for everyone, but can particularly help people with myofascial pain syndrome find relief. Posture training is more complex than it sounds, as exercises that target particular muscles can help prevent you from reverting to a harmful posture you may have grown used to over time. Massage. Massage, again performed by a physical therapist, can target trigger points, relieving tension and pain. When suffering from both fibromyalgia and myofascial pain chiropractic care might also be beneficial. Heat, whether from hot packs or showers, can also ease some of your discomfort. Injections sometimes play an important role in the path to symptom relief too. Your healthcare provider may inject a numbing solution or steroid into a trigger point, but sometimes just inserting a needle is enough to relieve tension. This process is known as "dry needling", and your doctor will target areas around the trigger point itself. Acupuncture, administered by a qualified professional, is another option. Ultrasound therapy relies on sound waves. It can help heal muscles and relieve pain by promoting a good circulation and offering warmth.